The Assam Mountaineering Association team is waiting for the Nepal government decision on continuing expeditions. At the moment when the devastating earthquake first struck Nepal on Saturday, they were on an acclimatization session above the Base Camp. They felt the tremors and then were cut off. After about four hours of trekking down that they reached back to the Base Camp to find the place devastated. 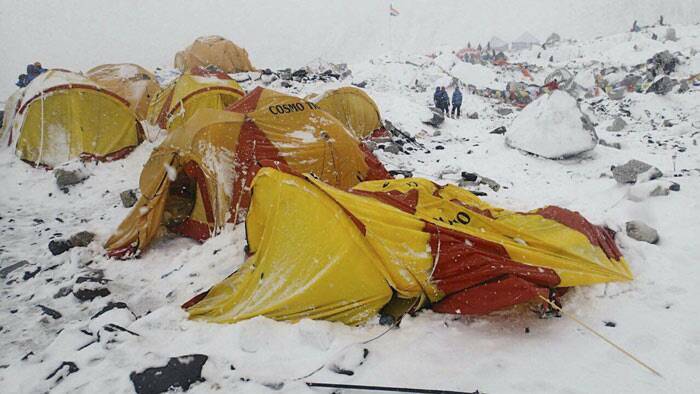 Several mountaineers who were present in the Base Camp were already dead and their bodies strewn all over. Yet the 11-member team of the Assam Mountaineering Association (AMA) that had left Guwahati on April 3 for Mt Everest has refused to give up hope. “They are not willing to give up. Though they had descended to Gorak Shep after the Base Camp was devastated, the team has gone up to Base camp again on Monday. Now they are waiting for the Nepal government’s decision on whether to let the expeditions continue or call them off,” said Satyen Sarma, president of AMA here on Tuesday. The Assam team led by Manash Barooah (46) also has Guwahati-based television journalist Pranay Bordoloi, a veteran who had narrowly missed Mt Everest two years ago. “We are totally confused when we heard of the earthquake damage in Nepal. When news of the death of 22 mountaineers came, I had almost fainted. But he called up around 5:30 PM on that fateful day to tell me that he and all his team-mates were safe,” said Bordoloi’s wife Reema. “Our team had carried out very rigorous training for this expedition. Though the earthquake has come as a major impediment, the team members are still hopeful that they would be permitted to go ahead. I spoke to them around noon today,” AMA president Sarma informed. The Nepal government is holding a crucial meeting on Wednesday to decide whether to let this year’s Mt Everest expeditions to continue or call them off, he added. At least 22 mountaineers have been killed after the avalanche triggered off by Saturday’s earthquake swept across the Base Camp area. Luckily, none of the casualties were from India. Apart from the 11-member Assam team and two-time Everester Anshu Jamsenpa of Arunachal Pradesh, other Indian groups included a team from the Indian Army too. Anshu Jansempa, who holds the world record of being the first and only woman to have scaled Mt Everest, as also another world record of climbing Mt Everest twice withen ten days, is currently located at Gorakshep camp, which is about 500 metres below the Everest Base Camp. “I have been speaking to her every day. She is safe, and wants to make it to the top despite the adversities,” said her husband Tsering Wange, who is also President of Arunachal Mountaineering & Adventure Sports Association.